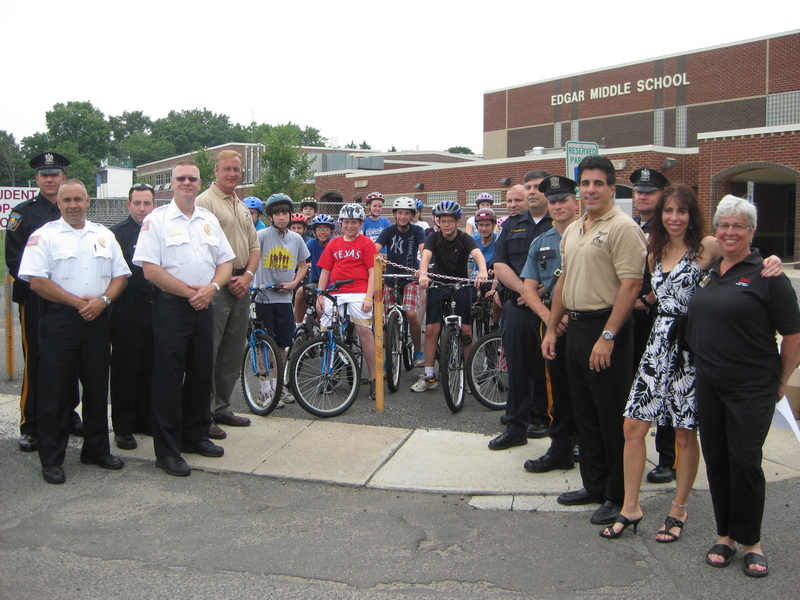 Representatives from participating police departments – Cranbury, Highland Park, Metuchen, Middlesex, Monroe, Plainsboro, South Brunswick (not pictured: Dunellen & Edison), H. James Polos, Middlesex County Freeholder, David Gregor, Middlesex County Comprehensive Traffic Safety Program Coordinator, Wendy Berk, Coordinator of Injury Prevention Services, BIANJ, Diana Starace, Coordinator of Safe Kids Middlesex County, Level One Trauma Center, RWJUH, and student bicyclists from Edgar Middle School, Metuchen. In an effort to reduce traumatic brain injury in children, Safe Kids Middlesex County of the Level 1 Trauma Center at Robert Wood Johnson University Hospital is kicking off its 6th Annual “wheels Under Your Feet? Helmet on Your Head!” Think Positive Campaign – a four-month helmet safety program – in nine Middlesex County municipalities. This helmet safety campaign, part of a statewide education and awareness initiative to promote the expanded helmet law requiring all children under 17 to wear a helmet, will reward children who wear a helmet when participating in wheeled activities such as bicycling, skateboarding, rollerblading, or riding a scooter. Town police officers will give a “summons” to any child “caught” wearing their helmet between June 21 and September 30. Each summons can be redeemed for free items and enters the child in a raffle drawing. According to the U.S. Consumer Product Safety Commission, approximately 190,000 children sustain head injuries while participating in wheeled activities. Brain injuries often have lifelong effects, such as problems with thought processes, mobility and emotions. There is no cure for brain injury so prevention is extremely important. The Centers for Disease Control and Prevention estimates that a properly worn helmet can reduce the risk of brain injury by as much as 90%. Unfortunately, less than 50% of children wear helmets regularly. Last year, Cranbury police gave out 500 summonses, and parents wear their helmets as well after realizing the importance of helmet use. “You would think we were the ice cream man. The children see a police car and if they aren’t riding their bicycles already, they will run out and put on their helmets and ride their bikes in front of us,” said Sgt. Greg Pfremmer of the Cranbury Township Police Department. Each summons awards a free scoop of ice cream, Italian ice, or slice of pizza and small soda, depending on the town’s sponsoring merchant. The summons also contains information about the new state helmet law as well as information about the correct way to wear a helmet. Every time a child receives a summons his/her name will be entered into a raffle toward a new bike and helmet, and one winner from each town will be selected at the end of the campaign. Cranbury’s program, sponsored in part by the Brain Injury Association of New Jersey and the Level One Trauma Center at Robert Wood Johnson University Hospital, will join the Safe Kids Middlesex County campaign this summer along with Dunellen, Middlesex Borough, Metuchen, Highland Park, Edison, Monroe, Plainsboro, and South Brunswick. Each participating town is encouraged to hold an “All-Wheeled Sports Rodeo” where children showing up with wheels and a helmet can go through an obstacle course and receive a “certificate” upon completion of the course. Each rodeo will also offer bicycle maintenance checks, town bike registrations, and opportunities for education and proper helmet fitting. For children in need, new helmets will be provided through the generous support of the Middlesex County Comprehensive Traffic Safety Program In addition, participating towns are encouraged to spread the message about wheeled-sports safety by providing educational programs in their schools. Sponsored by Safe Kids Middlesex County, the Level One Trauma Center at Robert Wood Johnson University Hospital, Middlesex County Comprehensive Traffic Safety Program, the Brain Injury Association of New Jersey and the New Jersey Division of Highway Traffic Safety, the success of the campaign will be measured by pre- and post-campaign observational studies looking at the percentage of children wearing a helmet while participating in any wheeled sport. Anyone interested in learning more about this campaign or other safety programs should contactSafeKidsMiddlesexCountyat (732) 418-8026.